As an aspiring personal trainer, there is a good chance you’ve considered a NASM certification to add to your list of professional accolades. There’s good reason too, NASM is considered to be a global leader in credentialing fitness professionals, and their wealth of certifications will prepare you for a promising career in personal training or one of their other areas of specializations. Below is a NASM certification review from an actual certified NASM CPT (me), and an overview of the NASM company, the NASM CPT and other certifications, some notes on the ever popular NASM OPT model, and lots of other important information on costs, reviews, salaries, and your next steps should you choose to pursue a career with NASM. NASM stands for the National Academy of Sports Medicine, a 30-year old company best-known for their Certified Personal Trainer (CPT) program. Within the last 10 years, NASM has certified and recertified more personal trainers than any other personal training company, helping nearly 200,000 obtain, or maintain, their CPTs all across the globe. NASM is also NCCA-certified, meaning they have the National Commission for Certifying Agencies credentials, the first standards ever developed to ensure a fitness certification body has the essential elements of a high-quality program. 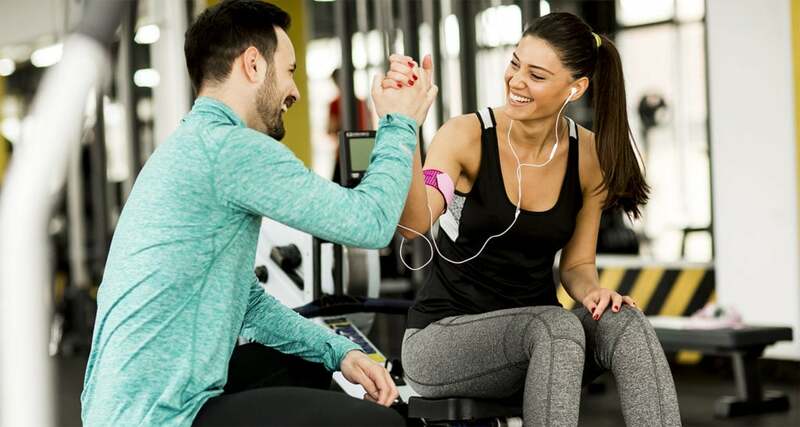 As a personal trainer, the global recognition and the NCCA-certification are important factors in choosing NASM as a potential candidate for your fitness education. Like other fitness certification bodies, NASM is best-known for its Certified Personal Trainer program. However, they also provide a number of other specializations that are worth mentioning. The NASM CPT is based on an evidence-based training model preparing students for real-life situations. In addition to learning and understanding complex scientific principles, students will use NASM’s proprietary Optimum Performance Training™ (OPT™) model, a systematic system that helps you train in various areas including: Flexibility, Cardiorespiratory, Core, Balance, Power, and Strength. The NASM CES is a specialization that can be applied to reduce muscular dysfunction and help you correct common movement issues. 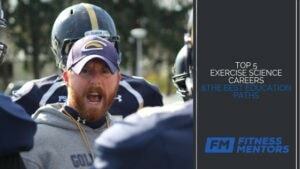 The corrective exercise continuum includes four areas, including: Inhibit, Lengthen, Activate, and Integrate. The NASM PES is designed to make athletes stronger, faster, and tougher. It uses approaches that are common in professional sports as well as exercise techniques and programs that are designed to maximize performance and minimize sports-related injury. The Behavior Change Specialization goes beyond the training elements and takes a deeper dive into motivational strategies. After completing this program, you’ll have the skill sets needed to determine your clients’ barriers to change, and design programs around their specific personalities. The Fitness Nutrition Specialization helps trainers explain to clients the true nutritional content of what they are eating and help them understand why they should, or shouldn’t, be eating it. This course will allow your clients to understand how to interpret food labels, select appropriate portion sizes, and eat healthy. 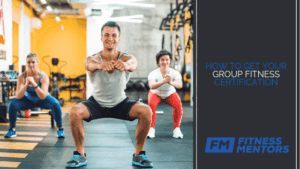 The Group Personal Training Specialization is a course that helps trainers design, develop, and deliver successful group fitness training programs. In addition to the physical fitness elements of this course, trainers will also learn how to develop strategic business plans around group fitness. The Weight Loss Specialization uses NASM’s OPT Model to help you design weight loss programs and develop strategies to assist clients in implementing a healthier lifestyle. The Women’s Fitness Specialization helps trainers become more effective at training women of all body types and ages. In addition to specific nutrition recommendations, it also involves exercise and small group training coursework. For trainers who want to capitalize on the growing exercise demand for people aged 6 to 19, the Youth Exercise Specialization helps kids focus on sports, increase their physical fitness levels, and lose weight. The Senior Fitness Specialization is designed to help trainers focus their exercise programs on the specific needs of seniors. This coursework includes helping seniors reduce risk, preserve independence, helps you to understand the aging process, and helps you understand the limitations of an older group of clients. The Golf Fitness Specialization is designed for the trainer who wants to help golfers be fit with corrective exercise strategies. While much of the focus is on injury-prevention, it also involves helping clients improve driving distance, how to increase head speed, and how to lower scores from a fitness perspective. The MMA Conditioning Specialization caters to the growing group of mixed martial artists who want to better condition their bodies to the rigors of MMA. It involves system design around individuals as well as group courses, and also includes nutritional and supplement guidance. 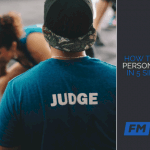 If you want to learn more about the various specializations and my personal thoughts on them, refer to this guide on NASM Personal Trainer Certifications. NASM has pioneered what is called the Optimum Performance Training (OPT™) model, a comprehensive training system that is heavily versed in scientific, evidence-based research. According to NASM, the emphasis on science makes OPT ideal for program design and delivering consistent results. Through the improvement of functional abilities including strength, balance, power, flexibility, core stabilization, and cardio endurance, this program helps clients from a wide variety of body types and ages increase muscle mass, reduce body fat, and improve overall health. OPT takes into account the individual and their needs, but also the environment in which they are performing. The program is not just for athletes, but also for seniors, the clinically obese, or those populations with special needs. It starts with an assessment of goals, needs and abilities, and takes a look at a client from the front, back, and side to evaluate the kinetic chain to make sure they are moving how they should be moving. With this information, trainers can then determine what exercises they should be doing to help clients’ reach their goals. Trainers should know that they don’t need a background in kinesiology or exercise science; they will learn all of this in their CPT and touch on it in additional certifications. NASM has multiple study options for aspiring trainers and they really boil down to choosing the one that is right for you. The main NASM certification that people want to know about is the NASM Certified Personal Trainer (CPT) certification. For the others, you can see the costs above. Each option offers progressively more study assistance and assets that will help you pass the test. If you want the best NASM study materials, created by college level NASM instructors who take the exam every year, check out our Free Study Guide for NASM and our Audio Lectures, Practice Tests and Study Guide for the NASM CPT Exam. These guides are the best on the internet and will help you save a considerable amount of money and time compared to NASM’s study packages. Our students boast a 99% pass rate, making the choice to utilize Fitness Mentors’ study materials a no-brainer! 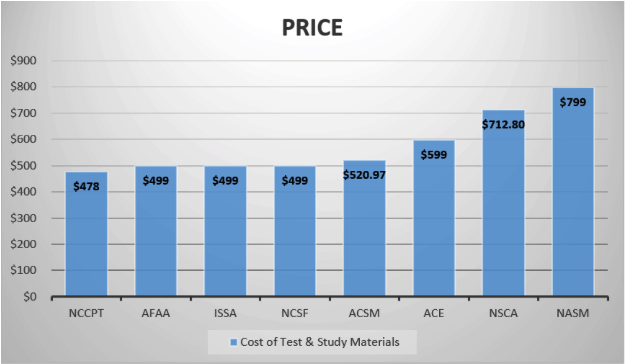 As you can see, the NASM CPT is the most expensive (considering exam and study materials) of all the major certification bodies. NASM is also considered to be the most popular of these brands, and there is a certain amount of prestige that goes along with their certification. At the same time, there are other options you should be weighing in addition to cost. For example, you should also take into consideration CEU requirements, the primary focus of education, and perhaps most importantly, if the place you want to work accepts the certification you are leaning towards. The NASM Facebook page shows that NASM has an average review rating of 8.2 out of 10. While this is a generally favorable average, I’d encourage you to speak with some NASM trainers to gauge their experience with the test, their studies, and how a NASM CPT played into their careers. 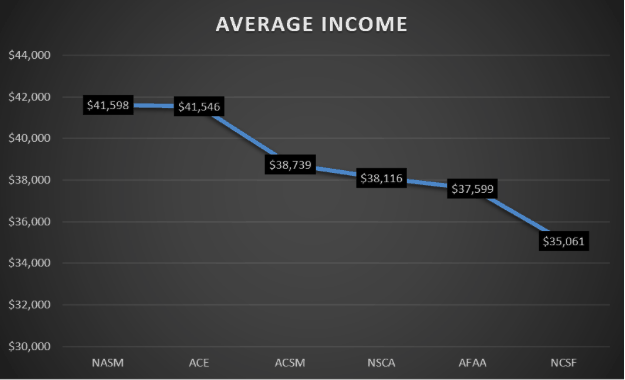 In the aforementioned blog post we did on the Best Personal Trainer Certification, we evaluated the average income of NASM, ACE, ACSM, NSCA, AFAA, and NCSF personal trainers. 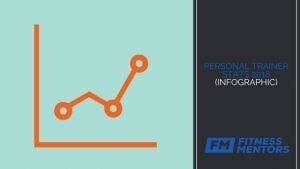 This data was pulled from reputable websites where registered users self-report their income. The top tier of these incomes was with NASM, at $41,598 annually. It was followed closely by ACE at $41,546. The others were below the $40k a year annual salary. The important thing to note is that these are just averages; your ability to be successful greatly depends on your business acumen and less about the words after your name. Regardless, it is interesting to note that on average, NASM trainers make the most. From there, you simply sign up for one the aforementioned study programs on the NASM website and begin studying, then schedule a time to take the exam once you feel prepared. How do you know if you’ll be prepared? The Fitness Mentors Online Course for the NASM CPT Exam comes with a pass guarantee, so that is a good place to start. If you have any questions, please leave them in the comments below and I will get to them as soon as possible.